Sir Walter Parratt was an organist and composer who served as Organist in St George’s Chapel for forty-two years. During that period he and his wife, Emma, lived below the Vicars’ Hall in No. 12 The Cloisters: the building which today houses the St George’s Chapel Archives. 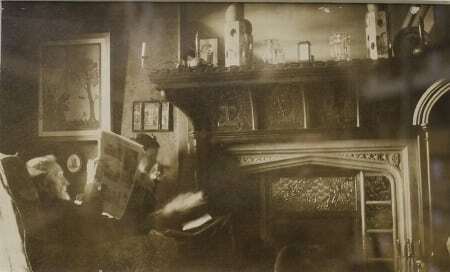 This photograph, taken by their son Geoffrey, shows husband and wife at ease in their sitting room. 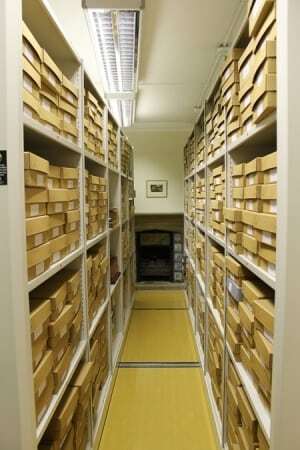 The room’s current function as our largest strongroom, in which the temperature and relative humidity levels are carefully monitored for the benefit of the documents stored there, means it is now far from the ideal environment for relaxing comfortably. The fire place by which they are sitting, however, is still in situ and this photograph hangs above it, acting as a window into the past. It has an added poignancy as it was taken on the 10th February 1924 in celebration of Sir Walter’s 83rd birthday, only six weeks before he passed away in March. Sir Walter took up the post of organist at St George’s in July 1882. He had always had exceptional musical talent, allegedly being able to play, from memory, all forty-eight of Bach’s preludes and fugues by the age of ten. Prior to St George’s he served as church organist in a variety of areas, including Huddersfield and Wigan, moving to work at Magdalen College, Oxford in 1872. Whilst in the latter post he met and formed a great friendship with Prince Leopold, Duke of Albany, the youngest son of Queen Victoria and from this Parratt came to know the Queen and formed a close and influential association with the Royal Family. He was knighted in 1892 and appointed “Master of the Queen’s Musicke” and private organist to her Majesty in 1893. During his time at St George’s he would play at many royal services, including the wedding of Leopold’s daughter, Princess Alice of Albany, to Prince Alexander of Teck in 1904 and of Princess Margaret of Connaught to Prince Gustavus Adolphus (later King of Sweden) in 1905. He also played for the funerals of two British Sovereigns: Queen Victoria in 1901 and Edward VII in 1910. Under his leadership the St George’s Chapel Choir travelled to perform at Westminster Abbey for Queen Victoria’s Golden Jubilee and at St Paul’s Cathedral for her Diamond Jubilee. Sir Walter’s lasting reputation as director of the choir at St George’s is one of formidable attention to detail and insistence on absolute accuracy. His entry in E.H. Fellowes’s book on St George’s organists describes how, as a result of this, “the purity of intonation under his choir-mastership was admirable.” It was largely due to his commitment and determination that daily choral services were maintained throughout the duration of the First World War despite most of the lay clerks having left to join the army, leaving no more than four available to sing in the Chapel. Alongside his role as Organist at St George’s, Sir Walter also held the Professorship of the Organ at the Royal College of Music (then newly founded) from the time he moved here until the end of his life. Many of his pupils went on also to be brilliant organists and Parratt was ranked as the greatest teacher of the Organ of the time. After his death, Sir Walter’s ashes were interred by the entrance to the organ-loft. The Chapter granted Emma Parratt use of No. 12, officially the Organist’s house, for the rest of her life. No. 12 ceased to be used as a place of residence in the 1990s when the building was converted to allow the safe storage and use of the Chapel’s archives. These had previously been kept in the Schorn Tower and the Aerary, where some of them had been since the mid-fourteenth century. Fellowes, E. H., Organists and Masters of the Choristers of St George’s Chapel in Windsor Castle (Windsor, 1939), p. 81. Fellowes, E. H., Organists and Masters of the Choristers of St George’s Chapel in Windsor Castle (Windsor, 1939), p. 84.